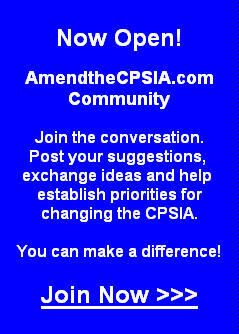 CPSIA - Participate in the AAFA Email Campaign to AMEND THE CPSIA! The American Apparel and Footwear Association sent out the following request to the thousands of affected companies and individuals concerned about Congress' inaction on the CPSIA. Please show your support by sending in an email in support of ECADA (the pending CPSIA Amendment in the House Energy and Commerce Committee). "Hi. 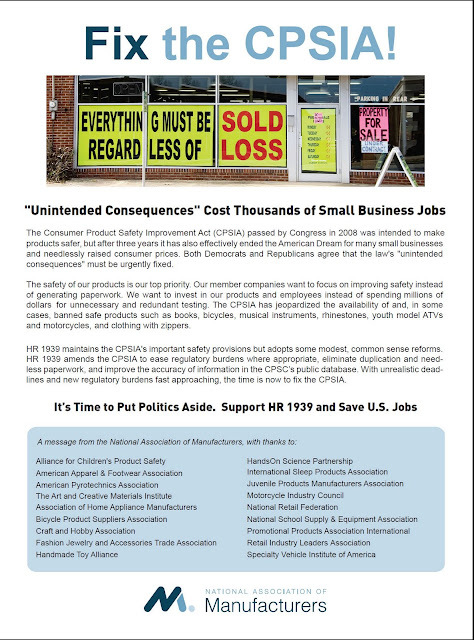 At some point over the past few years, you have contacted Congress to urge relief from the crushing burdens of the Consumer Product Safety Improvement Act (CPSIA) using the legislative action center that we host on the AAFA website. Your advocacy has proved critical in raising Congressional awareness of the many problems that have characterized the CPSIA so far. But we still need your help. Urgently! A key House committee is currently considering amendments to the CPSIA that would provide relief in a number of areas, including testing, inaccessibility for phthalates, very small business, used products, ATVs and bikes, and retroactive application of the lead rules. This amendment (H.R. 1939) will make our product safety system operate smarter while making sure that small businesses and other product safety stakeholders don’t get smothered in stifling regulations, extraordinary testing costs, and burdensome paperwork. We can’t let serious product safety risks be ignored while we endlessly test safe products and drive companies out of the children’s product business. This amendment will not be considered unless Members of Congress hear from their constituents – you and your neighbors – demanding immediate action. Help us bring commonsense back to our product safety rules. Time for action is now. Your voice matters. Please take a moment and send an email to your elected House and Senate members urging them to swiftly pass an amendment to the CPSIA. Please urge your family and friends to contact Congress. Click here to make your voice heard and help get action on this important issue. CPSIA - What Exactly Happened at the July 20th CPSC Commission Meeting? What happened on July 20th at the CPSC Commission hearing? I wish I knew. We must rely on a BNA article and gossip from those who were present or happened to be wasting their morning watching the spectacle live online. Apparently Inez Tenenbaum made some blanket statements rejecting the President's Executive Order of July 11 relating to cost-benefit analysis of provisions of the CPSIA. Of course, how would I know what she said? The video at the Sunshine State of the CPSC is not available to me. Two days later . . . . Hmmm. Do you think they are waiting for me to forget about it??? Ms. T seems to be saying that the agency was not permitted to follow the Executive Order because this setting of standards is not a "regulation" but is instead a "statutory mandate". There is no such thing as a "mandate" in this context from a legal point of view. See the definition of "mandate". Essentially, what the regulators are referring to as a "mandate" is the directive by Congress to take certain steps and exercise judgment coupled with a public inquiry process, meaning that it must be a well-informed process taking into account the feedback of interested stakeholders. Section 101(a)(2)(C): "100 PARTS PER MILLION.—Except as provided in subparagraphs (D) and (E), beginning on the date that is 3 years after the date of enactment of this Act, subparagraph (B) shall be applied by substituting ‘100 parts per million’ for ‘300 parts per million’ unless the Commission determines that a limit of 100 parts per million is not technologically feasible for a product or product category. The Commission may make such a determination only after notice and a hearing and after analyzing the public health protections associated with substantially reducing lead in children’s products." Section 101(a)(2)(D): "ALTERNATE REDUCTION OF LIMIT.—If the Commission determines under subparagraph (C) that the 100 parts per million limit is not technologically feasible for a product or product category, the Commission shall, by regulation, establish an amount that is the lowest amount of lead, lower than 300 parts per million, the Commission determines to be technologically feasible to achieve for that product or product category. The amount of lead established by the Commission under the preceding sentence shall be substituted for the 300 parts per million limit under subparagraph (B) beginning on the date that is 3 years after the date of enactment of this Act." Section 101(e): "PENDING RULEMAKING PROCEEDINGS TO HAVE NO EFFECT— The pendency of a rulemaking proceeding to consider— (1) a delay in the effective date of a limit or an alternate limit under this section related to technological feasibility . . . shall not delay the effect of any provision or limit under this section nor shall it stay general enforcement of the requirements of this section." [Emphasis added] Section 101(e) refers to the process that just concluded as a "rulemaking proceeding". I don't know how you feel about this, but this section of the CPSIA sure sounds like an instruction to administer a rulemaking proceeding to me. This is not a direction to reach a particular conclusion - if it is a "mandate" at all, it is a "mandate" to go through a classic regulatory process. Read the instructions yourself, it's right there. Ms. T interpreted the words "to the extent permitted by law" as "to remain true to their statutory mandates". Ms. T, a lawyer, is blatantly wrong, laughably so. Unfortunately, it's not funny. Ms. Tenenbaum has taken the position that cost-benefit analysis is not relevant to the CPSIA. Of course, you know I think that's a bunch of bunk. The President's Executive Order is plainly applicable to this rulemaking process and Tenenbaum may be daring you or me to sue her. I would like to point out, however, that when rules of legislative interpretation are applied to the CPSIA, her shoddy legal conclusions look even worse. "SEC. 233. COST-BENEFIT ANALYSIS UNDER THE POISON PREVENTION PACKAGING ACT OF 1970. Section 3 of the Poison Prevention Packaging Act of 1970 (15 U.S.C. 1472) is amended by adding at the end thereof the following: ‘(e) Nothing in this Act shall be construed to require the Consumer Product Safety Commission, in establishing a standard under this section, to prepare a comparison of the costs that would be incurred in complying with such standard with the benefits of such standard.'" If Congress was so concerned that cost-benefit should never apply to these provisions, why didn't they say it? They weren't silent on cost-benefit - Congress thought enough of the issue to mention it in context of the Poison Prevention Packaging Act of 1970. But as it relates to lead and phthalates, Congress was silent on cost-benefit. Why might they have been silent? Perhaps the authors of the law believed it was an illegal provision as applied to these rules. Perhaps the Dems behind the law felt the CPSIA wouldn't pass if such an obnoxious term were included in this critical part of the law. Perhaps those people figured no one would call their bluff, and that later, politically-aligned appointees would simply make up the law the authors couldn't write themselves. As this week's WSJ Editorial implies, we are powerless to stop Tenenbaum, Adler and Moore. They can run rampant over our laws, our companies, our markets, our jobs, our lives. They are the law, they are the judges, they are the jury. They know what's best for us, and no public hearings are going to change their minds. Oops, make that no Presidential Executive Order will change their minds . . . . The time left to Congress to act on amending the CPSIA before the 100 ppm lead standard boom crushes more businesses and jobs is only 24 days. [Html version of the ad] This includes the time to get through the Senate, then conference, then to the President for signature. Not a lot of time . . . and par for the course for this government, I suppose. Will they act in time? I certainly hope so but with Henry Waxman doing his evil best to prevent any progress on this issue, I don't have high expectations. Let's hope some Democrats still have a conscience. There have been nine editorials by The Wall Street Journal against the CPSIA. I thought you might enjoy seeing them all in one place. Below you will find links to all nine editorials, with a short highlight from each one. The more things change, the more they stay the same . . . .
"The damage comes from new rules governing lead in children's products. After last year's scare over contaminated toys made in China, Congress leapt in to require all products aimed at children under 12 years old to be certified as safe and virtually lead-free by independent testing. The burden may be manageable for big manufacturers and retailers that can absorb the costs of discarded inventory and afford to hire more lawyers. Less likely to survive are hundreds of small businesses and craftspeople getting hit with new costs in a down economy." New lead rules hit next Tuesday. Whammo. "CPSC Chairman Nancy Nord has noted that the law has created 'chaos and confusion,' and as if to prove her point, yesterday New York federal Judge Paul G. Gardephe ruled that the law's limits on a plasticizer known as "phthalates" should apply to existing inventory just as lead standards do -- overturning a CPSC ruling to the contrary. That makes it even clearer that Congress needs to fix its own mess. Trouble is, House Speaker Nancy Pelosi is heavily invested in the fiasco. On passing the misguided law in August, she proclaimed that 'with this legislation . . . we will be removing these products from the shelves.' Taking store owners and toy entrepreneurs with her." "Democrats in Congress have leapt to criticize acting CPSC Chairman Nancy Nord, in hopes President Obama will replace her. But the real culprit here isn't the CPSC, which is overwhelmed with requests from manufacturers trying to make sense of the chaos that Congress created. House Energy and Commerce Chairman Henry Waxman has dismissed efforts to improve the law, claiming the real problem is that "misinformation has spread" about the impact on businesses." "The multibillion-dollar children's motorcycle and all-terrain vehicle industry has been clobbered. Kids motorcross racing has boomed in recent years in rural and Western states. And the regulators at the Consumer Product Safety Commission (CPSC) have decided that virtually all of these youth vehicles violate the new standards because of lead in the brakes, tire valves and gears. They've ordered motorcycle dealers to stop selling them, putting hundreds of dealers and the entire motorcross industry in a depression. With one stroke of the regulatory pen, an estimated $100 million of inventory can't be sold, and the industry loss may reach $1 billion." "Jewelry makers now join the legions of other businesses on the hook for millions of dollars in lost sales, inventory or testing costs despite products that pose little to no risk of lead poisoning to children. In the spring, thrift-store operators like Goodwill and the Salvation Army predicted that without regulatory relief they would have to destroy more than $100 million of inventory. Toy stores expected some $600 million in playthings that would have to be trashed and another $2 billion in losses across the industry. Motorcycle and ATV makers predicted total losses and business disruptions around $1 billion. Children's clothing stores have suffered huge losses, with Gymboree losing 40% of its market value overnight after reporting losses related to the House's lead-paint panic." "CPSC Commissioner Anne Northrop noted that the decision not to grant a brass exemption shows that 'the Commission does not believe there is any [flexibility] written into the law.' Without action from Congress to address the chaos it created, Ms. Northrop said, 'More small businesses will be forced to shut down.' CPSC Chairman Inez Tenenbaum has insisted that changing the law would be 'premature.' Yet it has already been more than a year of bedlam for manufacturers and retailers negotiating these rules." A fix of a bad law that is no fix at all. "Mr. Waxman is insisting that any product applying for an exemption would still be subject to a three-pronged test to determine whether stripping lead from the product is 'practicable or technologically feasible,' whether a product might end up in a child's mouth and whether its exemption would affect public safety. In a response, CPSC Commissioner Nancy Nord explained that since all three tests have to be met for a product to qualify, 'the exception is as empty as the exception for no absorption of any lead. Such a provision does not really help anyone.' . . . If Mr. Waxman wants to enhance Congress's original creation, he should start by letting product safety regulators consider whether products are safe." "The law also requires the CPSC to propose the parameters of a third-party lead testing regime, but the issue is so mired in complexity that the commission has yet to set those standards. Under the proposed version of this so-called '15 Month Rule,' Learning Resources Chairman Rick Woldenberg has estimated that supplying multiple testing samples on each of his company's toys and products will cost his company some $15 million per year. . . . At a hearing in the House Energy and Commerce Committee in February, California Democrat Henry Waxman defended the law as 'necessary to protect kids and families across the country.' We wonder how he figures that, since the incidence of lead poisoning from toys made by domestic manufacturers is nil." Another agency ignores Mr. Obama's executive order. "Here's a question for White House regulatory czar Cass Sunstein: Do Presidential executive orders mean anything? Only last week President Obama asked independent agencies to examine existing rules and get rid of the duds, but nobody is listening. . . . Mr. Obama's recent executive order is voluntary, but the President told agency heads that getting rid of red tape was an opportunity to 'forge a 21st-century regulatory system that makes our economy stronger and more competitive.' Perhaps Mr. Sunstein will tell toy makers it's the thought that counts." Here's a question for White House regulatory czar Cass Sunstein: Do Presidential executive orders mean anything? Only last week President Obama asked independent agencies to examine existing rules and get rid of the duds, but nobody is listening. Within days of the executive order, the Consumer Product Safety Commission voted 3-2 that it is "technologically feasible" to impose a lower limit on lead content in children's products, reducing the level to 100 parts per million from 300 parts per million. The new limit, which will go into effect August 14, will mean one more round of hair-pulling for small business owners who will have to change their manufacturing processes and junk existing products that don't meet the new standard. The three votes in favor came from Mr. Obama's chairwoman Inez Tenenbaum and two other Democratic commissioners. The Consumer Product Safety Improvement Act passed in 2008 in a frenzy of concern over lead content in toys from China, and it has since tormented anyone who makes or sells bicycles, books, children's jewelry and so much more. Its strictures have imposed costs for testing, recalls and other inconveniences without any reasonable correlation to the risks to children. "No sweetheart, don't eat that bicycle!" According to the CPSC, the plan to require that products be 99.99% lead free is reasonable because manufacturers would still be able to find materials and because some products already comply. While the additional safety gain will be negligible, the change will do damage in other ways, causing companies to avoid recycled metal and plastic, which may contain higher amounts of lead. It will also raise costs for metal parts, potentially driving some businesses to substitute plastic for metal, or stop producing children's products. In the bicycle industry, a quarter of manufacturers have stopped making kids bikes. Instead of fixing its manifest flaws, Congressional Democrats who wrote the law have shrugged off small business complaints and opposed any changes. Energy and Commerce Chairman Fred Upton and Commerce, Manufacturing and Trade Subcommittee Chair Mary Bono Mack introduced reforms earlier this year that would revise the law and give the CPSC greater authority to make regulation decisions based on actual risk. The bill is waiting for a mark-up at full committee but any reprieve would likely come too late for businesses facing the mid-August deadline. Mr. Obama's recent executive order is voluntary, but the President told agency heads that getting rid of red tape was an opportunity to "forge a 21st-century regulatory system that makes our economy stronger and more competitive." Perhaps Mr. Sunstein will tell toy makers it's the thought that counts.